BOTTOM LINE: An elegant and potentially beautiful new play that is hindered by a lack of focus and detail. 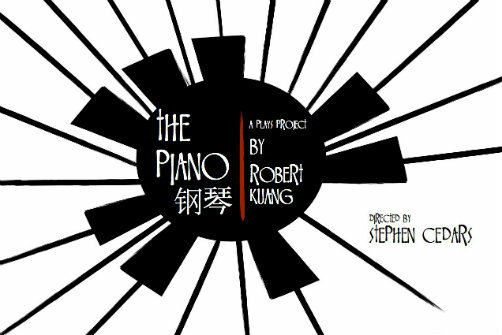 When I entered the theatre to see Robert Kuang’s new play, The Piano, I was instantly welcomed by a simple, yet elegant set design by Tyler M. Perry. The set lacked detail by way of dressing, but the organized focus of three specific acting areas -- one of them being an upright piano -- delivered the promise of a play written and expressed clearly. Unfortunately, the play lacks the set design’s remarkable focus, but shares its lack of detail. At the beginning of the play, we meet Shine-Shine, an Asian-American teenager, played with appropriate adolescent angst by Jessica Anne Cox. She grows flustered as she rehearses piano selections for her upcoming college auditions. Though the character stumbles over the keys incessantly, Cox’s natural musical talent is apparent and enchanting, and she eventually gets the opportunity to play triumphantly before play’s end. In the second scene, we meet Shine-Shine’s parents, Nancy (Karen Tsen Lee) and George (Richard Welton), who have just returned from date night. We learn that Nancy’s father, who never approved of her marriage has passed away, prompting her mother, Julia (Jo Yang) to move in with the family. Julia insists on speaking Chinese exclusively -- her dialogue is subtitled -- and laments the fact that her granddaughter does not speak the language. At this point, the play seems to be about a clash of cultures. When George’s abrupt entrance startles Julia, she chases him brandishing a butcher knife and explains, “I thought you bad man.” This culture clash narrative would be more fruitful if we had more detail about George’s cultural background. He mentions that he is of Russian descent but no ethnicity is apparent in his behavior or identity, and he comes across generically white and American. Nancy starts visiting Shine-Shine’s piano teacher Lucas (played with tremendous likeability by Zac Jaffee) and is reunited with her passion for the piano. We learn that Nancy was once a very talented pianist who was forced to quit by her disapproving father. In her moment of reawakening, Nancy tries to kiss Lucas and confesses that she is unhappy in her marriage. By the end of the first act it becomes clear that this play has nothing to do with cultural barriers, but is about the erroneous direction life might take and the courage required to put it back on track. Shine-Shine wonders if she has devoted her entire life to the piano simply to make up for the failed dreams of her mother. Nancy realizes that she ultimately wants to be a piano teacher. When George points out that “a part of [her] died with her father,” we get the sense that she was only committed to her marriage to spite her father. Even Julia decides to abandon her plan to return to Beijing in favor of following her heart and opening a new Chinese restaurant. Kuang’s main theme is unanimously expressed by all of his characters. The problem is that he spends so much time developing tropes -- like culture clash, that do not serve his ideas -- and not enough time letting us in on central relationships. We do not experience a failed marriage between Nancy and George. We know it’s failing because Kuang tells us so. Their relationship is not developed enough to resemble a marriage at all, much less a failed one. We never learn what drew these characters together, and so we have no way of knowing what is pulling them apart. Kuang’s characters do express interesting ideas. In a spirited confrontation between Lucas and George, Lucas proclaims “I’m a musician and I’ll always be. Can you say the same thing?” This would be a powerful line if we knew more about who George is, but the commanding rhetoric is wasted on a character who is not developed enough to seem real. The ideas expressed by Kuang are far from trivial, and he deserves credit for trying to make them clear in a two-hour narrative. But Kuang would do well to refocus his story and fill in missing details about his characters. When he does, he will have a beautiful, human story filled with music and culture that will speak volumes about the courage necessary to correct mistakes and put life back on track.